Robbing – honey bees as thieves! 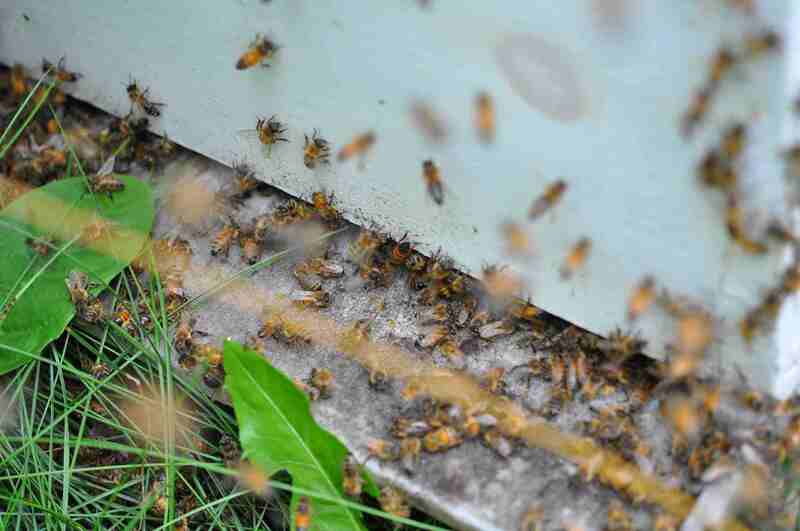 Posted on July 9, 2015 | Comments Off on Robbing – honey bees as thieves! Yes, our honey bees can become little criminals and steal from their neighbors! The threat of larceny is usually not great in the spring and early summer when a good nectar flow is on, but as the flow slows or stops (as occurs from time to time, especially in periods of dry weather), bees are on the lookout for any food they can find. So watch out! It is that time of year. The closest source is often a neighboring hive. Colonies with strong populations can usually defend themselves. New nucs and divides, recently captured swarms, and any hives which have not built up well or which are dwindling due to disease, pests, or other causes, are all likely targets of robbing bees. The culprits may come from your own hives, from your neighbor’s, or from nearby bee trees. Heavily robbed hives can face starvation very quickly, so beekeepers need to be vigilant in order to prevent or reduce this activity. What does a hive being robbed look like? Robbing is characterized by abnormal activity at the hive entrance, and large numbers of bees in the air around the hive. At times other normal flight activities will give the same appearance, such as swarming, and daily orientation flights of new bees. these normal activities are short in duration, while robbing continues non0stop. during robbing we also see fighting at the entrance, and resulting dead bees. However, during robbing, this increased activity is also accompanied by large numbers of bees on the surface of brood boxes, and supers, looking for alternative entrances. 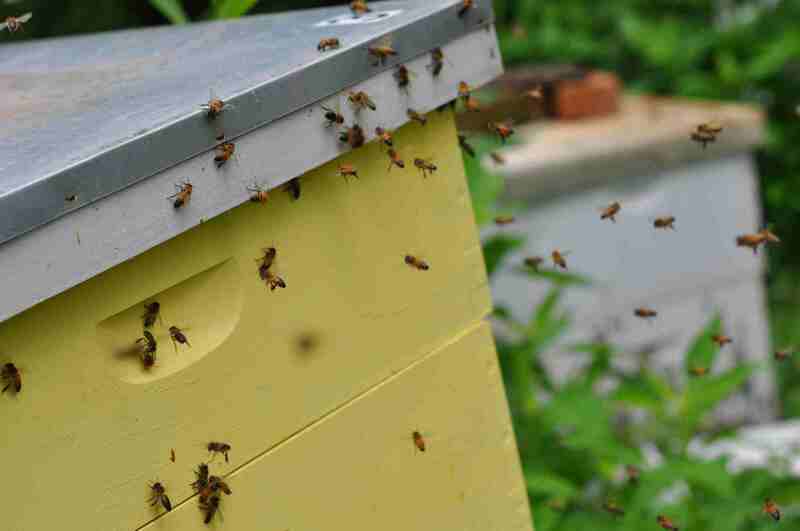 Bees are most apparent at the joints of adjoining hive bodies, and at the hive covers. See the below photos. We cannot manage nectar flows, but other circumstances which encourage robbing are more easily controlled. The first rule is to avoid open feeding. Feeding entire bee yards by setting out wet frames or by putting sugar syrup out in an open barrel or bucket (often with straw or wood floats inside), very often instigates robbing. Once robbing has begun, open feeding is more likely to fuel the feeding frenzy than to sate the bees. If you practice open feeding (WHICH I DO NOT RECOMMEND), first install entrance reducers, or robber screens (more on robber screens further on), in ALL of your hives and place the feeding bucket or barrel a couple of hundred feet from your apiary, preferably with an obstacle such as a building or a tree line between the syrup and the hives. 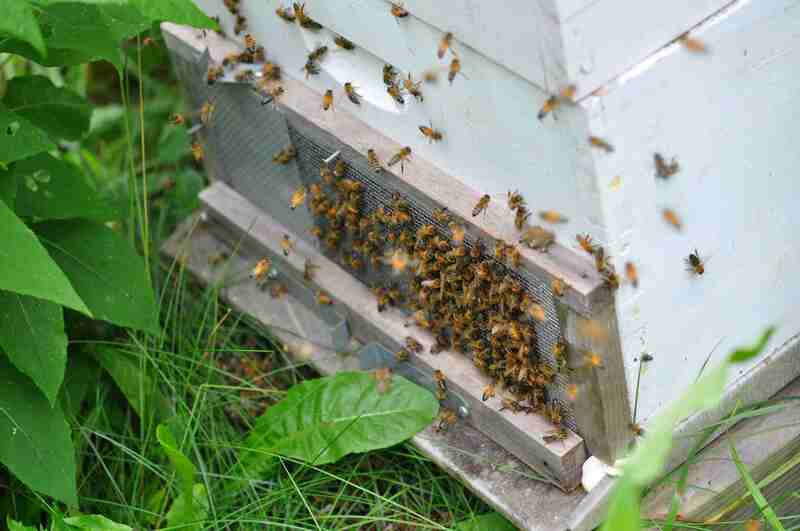 (Remove the entrance reducers from stronger hives after feeding is finished.) Open feeding and exposing honey can cause even strong colonies to be robbed. Another argument against it, especially during a dearth, is that you are very likely feeding, not just your own bees, but all the hives within a couple of miles, including feral colonies. 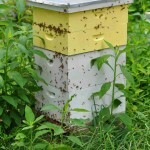 A robbing response can also be triggered by beekeepers while working hives or removing honey supers when there is not much of a nectar flow occurring. 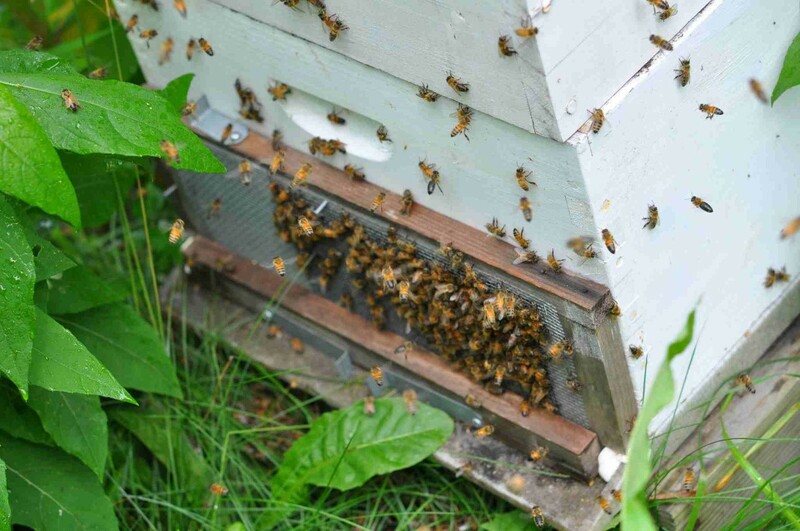 Supers of honey, or even open brood boxes, exposed in the bee yard can be all the temptation that’s needed to initiate the behavior and, once begun, it escalates rapidly. We need to go through hives quickly and cover boxes which are set off the hives when working hives during a nectar dearth. 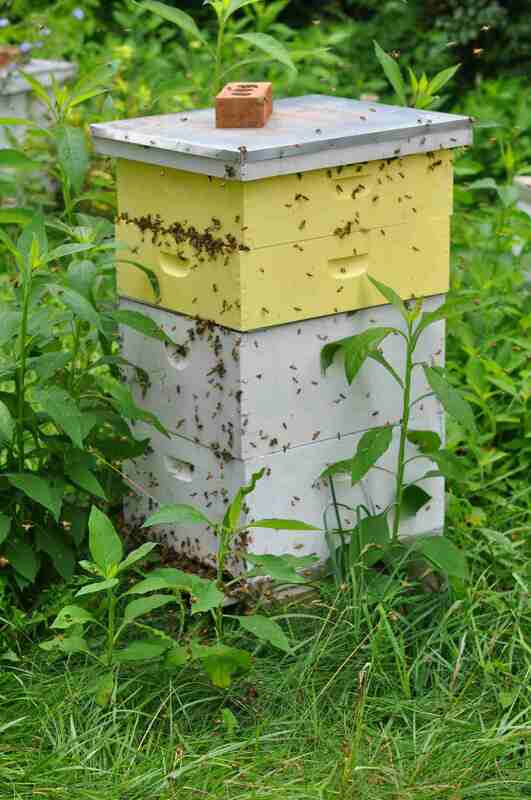 When removing supers, take them out of your apiary as quickly as possible and keep them well covered if they are temporarily left outside. 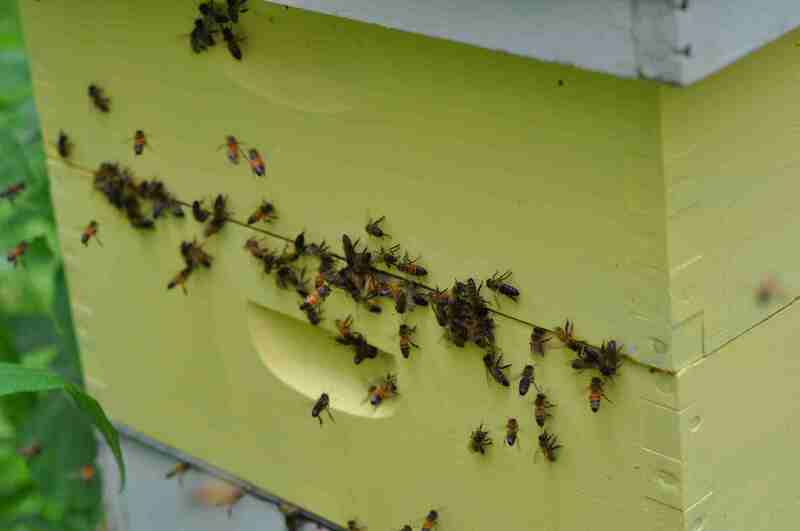 If you set wet supers out after extraction to allow the bees to clean out the remaining honey, do so at least several hundred feet away from your hives. Also, set them out late in the day to lessen the time for potential robbing. Better yet, set wet supers back on top of the hives (only on strong ones) and allow the bees to clean up the remaining honey within the hive. This should be done late in the day as well. Always keep an eye on your hives whenever you have exposed honey so that, if robbing begins, you can attempt to do something about it. The photos that go with this post were taken when I recently took some wet honey supers back to the bee yard for placing back on top of hives. I left those wet supers sitting uncovered for just a few minutes in the edge of the bee yard, and within minutes they were covered with hundreds of bees, who smelled the honey in the comb, though there was little honey remaining there. After I moved those supers onto a strong hive, robbing commenced in a weaker hive, which was located near where I left the supers sitting. I was lucky that only the one hive was involved. Learn from my mistake, keep wet supers, and supers removed from hives covered at ALL times. How can we stop robbing once it occurs? I use robber screens, or more accurately anti-robber screens. These are specially constructed screens that is placed in front of the hive entrance, leaving a small opening directly over it, but closing off the front entrance. The screen shown is a commercially manufactured device I purchased years ago. Robber screen, not door on top, and two doors on the bottom. They are also easy to make with some #8 hardware cloth, and many beekeepers do so. The key to the screen’s success is the top entrance. The bees inside the hive quickly figure out where the new entrance is and use it to go in and out of the hive. Robbing bees will continue to come to the screened front of the hive and seek entrance there, to no avail. Robber screen in place. Note: bottom doors closed, top single door open. Note the large number of bees on the screen, seeking entrance to the hive. A Virginia beekeeper friend, who has used such screens for years, told me that robbers only want to enter straight ahead, not up and down. I don’t know if that is a factor – I just know that they work. I think the bees go directly to the entrance drawn by the small of the honey, and stay on the screen since they can see the entrance. 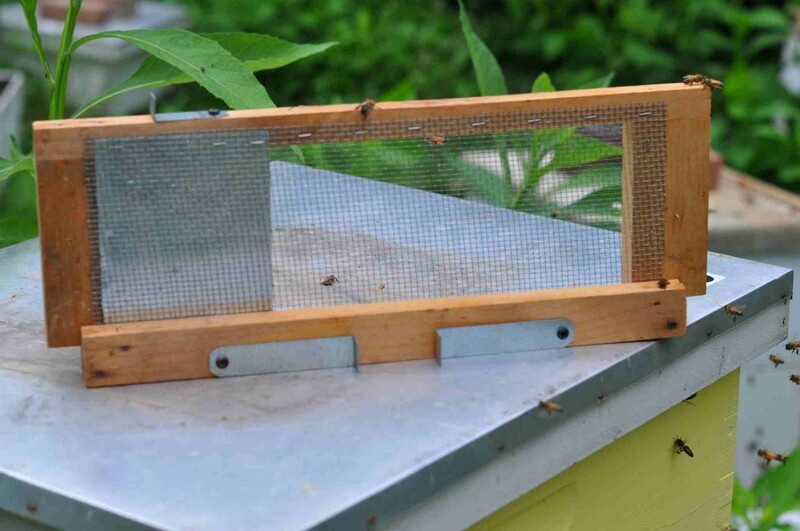 Though you can also install regular entrance reducers, at the onset, or threat of robbing, robber screens do not reduce air flow through the hive. This is a very important factor in hot weather. Note: Due to continued robing I also closed the top entrance, preventing any bees from entering hives. I felt that some robbing bees were making use of the top entrance. Later in the day I re-opened it, after robbing had subsided. The next day, after all robbing had ceased, I opened all the doors, but left the robber screen in place. Another way to stop robbing that is already underway, is temporarily sealing the entrance completely. Burlap placed in the entrance works well for this. Grass can be used as a substitute, but bees will remove grass fairly quickly. Remember to reopen the entrance at the end of the day, after the bees stop flying. When robbing is interrupted, it often does not resume the next day, but keep the entrance reducer or anti-robbing screen in, just in case, when you open the entrance back up. This entry was posted in Beginning Beekeeping, Hive management, Honey bee behavior, Honey bee or beekeeping research, Removing and processing your honey crop. Bookmark the permalink.